World Mental Health Day – 10 October – is a day for global mental health education, awareness and advocacy. An initiative of the World Federation for Mental Health to raise public awareness of mental health issues worldwide. 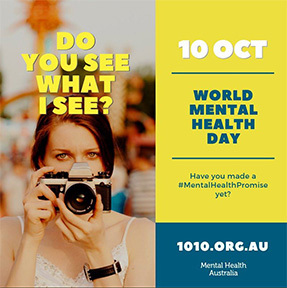 Mental Health Australia is delighted to be leading the World Mental Health Day campaign in Australia. As the peak not-for-profit organisation representing the mental health sector in Australia, Mental Health Australia has a focus on ensuring the whole community recognises the part we all play in creating a mentally healthy society. Do You See What I See? challenges perceptions about mental illness in Australia and encourages everyone to look at mental health in a more positive light, in an effort to reduce stigma and make way for more people to seek the help and support they deserve. Stigma around mental illness due to misunderstanding or prejudice remains an issue in Australia, delaying or preventing people from wanting or feeling able to seek help, and impacting adversely on their lives. Misconceptions and misrepresentations about those experiencing mental illness are damaging to people’s lives. They may include references to people affected as being ‘scary’, ‘comical’, ‘incompetent’, ‘weak’ or ‘hopeless’ and can appear anywhere, from in the media and the arts to conversations we have at work, school or home. At home, at work, with family and friends, or in the wider community, we can all do something to help reduce stigma around mental illness and make way for more people to seek the help and support. Make a promise – Use one of the many templates available, or create your own unique message to help shed a more positive light on mental health. Host or find an event – Host a Morning Tea for Mental Health or find an event in your area to support. Learn more – Find out more about mental health, resources and helplines available to you. It’s time to look at mental illness in a different light – a positive light. Partners in Recovery does not offer a crisis response. Need assistance now? Call Triple Zero (000) or go to a hospital if you are in immediate danger.